R10000-UNBXHF is rated 4.5 out of 5 by 57. Rated 5 out of 5 by Ernie from Bath Remodel I have received this item but not yet used it. My remodel project has not yet started. But it looks very good and sturdy. Heavy brass. Should start the project end of Dec 2018 or beginning of Jan 2019. Rated 5 out of 5 by Matt from Quality valve body Bought it a while ago, glad I finally got to install it. I had to do a little soldering and I put in a couple of shark-bite valves on the cold and hot inputs so that I can shut off and easily work on it in the future. Had to have some kind of coupler anyway. But, back to the point, this valve body looks like it will last a good long time. Only the cartridge will have to be replaced if it wears out. Rated 1 out of 5 by ravi from Defective less than 2 months defective, used for less than 2 months, shower won't turn off, plumber said defective cartridge. Rated 5 out of 5 by Wayne from No Issues No issues with the valve itself. Appears to be high quality. Only flaw I see is the trim kit. The external mounting screws don't seat all the way because the trim kit hole spacing is wider than the valve. Faucets Direct was great to work with and supplied a missing part super fast! Rated 5 out of 5 by MarshaLouise from Valve for shower bathroom No. 1 My plumber loved installing the Delta R10000-UNWSHF in my newly remodeled bathroom. I watched him wrap the white plumber tape around the fittings and bravo...shower works great and thankful that he used DELTA rough-in Valve. What is the difference between R10000-UNWS and R10000-UNBX valves? Thank you for your question. Delta Faucet model # R10000-UNWS includes screwdriver stops on the valve to allow the user to turn the water off at the valve for servicing. If the model has an HF in it, then it means High Flow and can only be used on a shower only application. can you list the trims available with this rough valve. I have the Delta R10000-UNBXHF Multichoice Universal Shower Only Valve installed along with the shower Delta Faucet T14286-SHQ Arzo. Everything works fine except the hot water is not hot enough even when the handle is fully turned into the hot area as indicated by the dots. What in the Multichoice Universal Shower Only Valve needs to be adjusted to have more hot water? I fixed a shower using an R1000-UNBX. It worked great but I had no way to find out what trim packages would work with it. I am now remodeling my tub/shower. Can I use a R1000-UNBX for the tub / shower or do I need a universal rough with a diverter? Which cartridge fits the r10000-unbxhf universal roughing ? R10000-UNBXHF used only as a 'shower' component? You make it very clear that there is a plug in the HF version for the tub spout. Please confirm that if you are ONLY using this valve for a TUB, not a shower, can you still use the HF valve and use the shower port for the tub port? Thank you for your question. Delta Faucet model # R10000-UNBXHF can only be used in a shower only application. It cannot be used in a tub only application or a tub/shower combination. 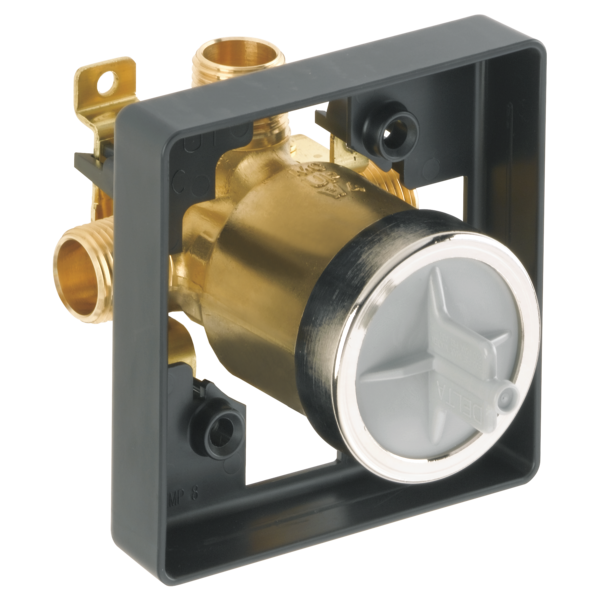 Does Delta R10000-UNBXHF Multichoice Universal Shower Only Valve Body contain an anti scald valve?